PHM is delighted to congratulate its clients for an extremely successful day at the What House? Awards 2018, where the entries we prepared on their behalf scooped 12 of the 66 awards, including 7 of the 20 Golds. The prestigious ceremony, known as the Oscars of the housebuilding industry, took place at the Grosvenor House Hotel on Friday 16th November and saw the best new homes and developments across the UK awarded in 20 categories. 2018 has officially been the best year on record for PHM’s award entries, with our clients scooping top accolades in every major housebuilding competition in the industry. 72% of all PHM entries in 2018 were shortlisted. Nearly 1 in 4 (23%) of the entries we’ve prepared this year on behalf of our clients have been awarded the Gold or top prize and more than 1 in 3 (36%) have won an accolade in their category. If you’d like to discuss how a strategic awards programme in 2019 can support your marketing objectives, get in touch with the team on info@housegroup.co.uk or 01483 561119. While 5th November is officially fireworks night, celebrations began early for PHM when our client, Berkeley, lit up the evening at the RICS Awards 2018. The awards ceremony took place on 2nd November at The Brewery in East London and celebrated inspirational initiatives in real estate, construction and infrastructure. 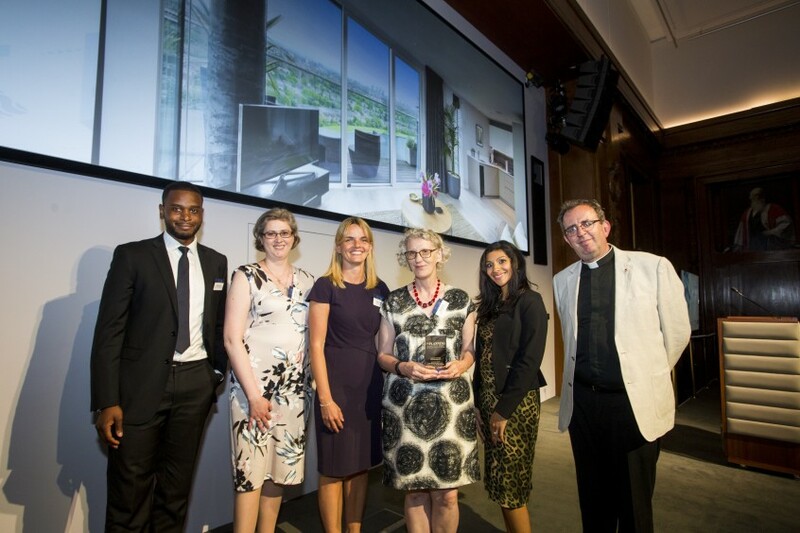 We were delighted to see Berkeley receive first prize in the Best Regeneration category for Woodberry Down. This exciting development in Hackney, North London, is one of the capital’s largest regeneration projects, providing place-shaping, social and economic change on an inspiring scale. If that wasn’t enough, the site was also awarded the prestigious title of Project of the Year – the grand finale for an already unforgettable night. Awards are a powerful marketing tool, allowing your company to demonstrate third-party endorsement from a reputed body of industry experts. If you’d like to know more, check out our blog on just how effective a tailor-made awards entry can be within your wider marketing strategy. If you’ve worked on a project or development of which you are particularly proud and would like to find out more about our awards service, call the PHM team now on 01483 561119. The WhatHouse? Awards is always a highlight in the property calendar, and for us it was a particularly brilliant way to round off the year, as 12 of the 21 entries we prepared on behalf of our clients scooped a prize at this year’s ceremony. A whopping six of those entries won gold, and Berkeley Group went on to take home Housebuilder of the Year 2017 – the overall prize of the night, picked from that year’s submitted entries. As always, it’s been a busy year for PHM writing and designing the WhatHouse? Award entries, and we were absolutely thrilled to celebrate our clients’ success at the Grosvenor House Hotel on Friday 17 November. Awards are a brilliant tool for marketing and promotion, offering a respected third-party endorsement as well as the prestige of industry recognition. If you’re considering entering awards next year for a development or project of which you’re particularly proud but not sure where to start, speak to the PHM team today on 01483 561119. It was a successful evening at the Building Awards on Thursday 7 November, as it saw our client Berkeley Group win the prestigious Housebuilder of the Year award, which we prepared earlier this year. A highly anticipated date in the property calendar, The Building Awards are the industry’s longest running recognition of excellence, and allow companies across all aspects of building to have their achievements held up as an example to the sector. As always, it was a great night hosted by Building magazine. We’re also looking forward to attending the WhatHouse? Awards later this month, where we’ll be excitedly awaiting the results for the 21 entries we prepared on behalf of our clients this year. Awards are a brilliant tool for marketing and promotion, offering a respected third-party endorsement as well as the prestige of industry recognition. If you’re unsure about the effectiveness of a tailor-made award entry, take a look at our blog, ‘Three reasons why awards are a valuable addition to your marketing strategy’, to see just how valuable they can be for your business’ marketing strategy. If you’ve worked on a project or development of which you are particularly proud, and would like to find out more about our awards writing and design service, call the PHM team now on 01483 561119. 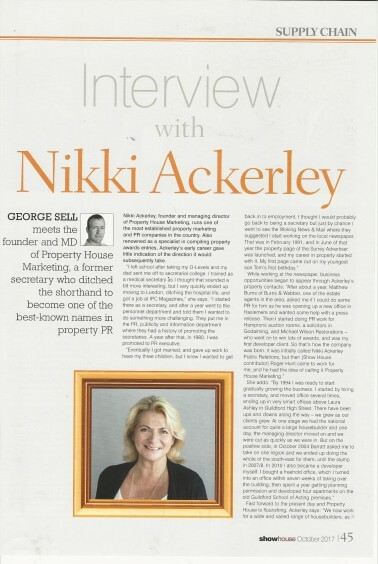 If you happen to pick up a copy of this month’s Showhouse, check out the Supply Chain feature – you’ll spot an interview with our very own MD Nikki Ackerley which takes a look how PHM approaches PR and marketing for its clients, and how Nikki became “one of the best-known names in property PR”. Nikki explains: “We offer a fully integrated PR approach, which includes digital marketing, social media, events, launches, managing community engagement consultations and exhibitions, copywriting for websites and other marketing collateral. What sets us apart is that we don’t just churn out press releases – local papers just don’t have space anymore so social media is key in reaching local target markets; for the national press it’s all about relationships and knowing what journalists want and how and what they write about. If you’d like to discuss how we can use our bespoke approach to meet your PR requirements, don’t hesitate to get in touch with our team on 01483 561119. It was the return of the annual Housing Design Awards last night and we’re delighted to share that the entry for Poplar Harca, written and designed by PHM, won an award for its regeneration plans of the former Burdett Estate in Mile End, East London. 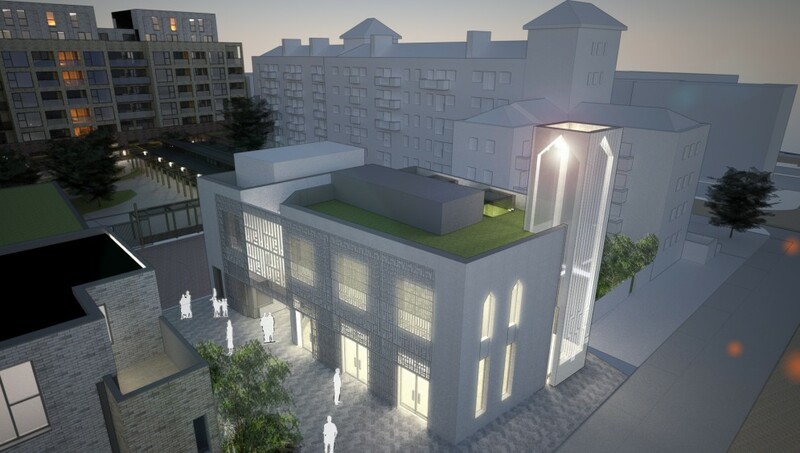 When complete, the project will provide the area with 109 new mixed-tenure homes, a new primary school and a central community space as well as a planned renovation of the existing local mosque. 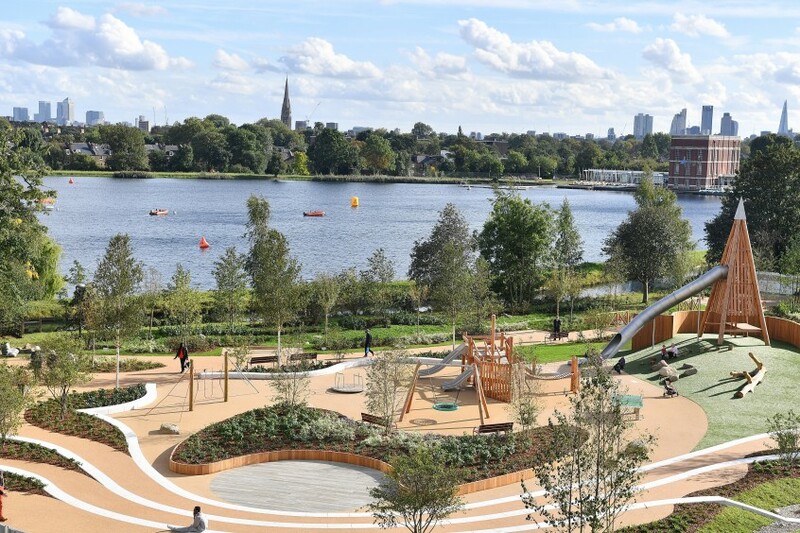 Permeability is a key feature of the site, creating maximum accessibility through connecting pathways between the bordering streets and the development’s central courtyard and playground. With sustainability in mind, the studios, one, two and three-bedroom apartments and two and three-bedroom duplexes will benefit from 183 on-site cycle storage spaces to encourage green travel in the city. Find out more about the winning St Paul’s Way Trust School Expansion and Burdett Estate Regeneration and the partners involved in the project. The Housing Design Awards were established in 1948 in an effort to commend high-quality post-war development. Judged by a panel of industry experts, they are Britain’s longest-running housing awards, which showcase projects to the Government and industry contacts. Awards are a fantastic tool for marketing and promotion, offering a respectful third-party endorsement as well as the prestige of industry recognition. If you’re unsure about the effectiveness of a tailor-made award entry, take a look at our recent blog to see just how valuable they can be for your business’ marketing strategy. It was a successful night at this year’s Planning Awards for our client, Berkeley Homes. 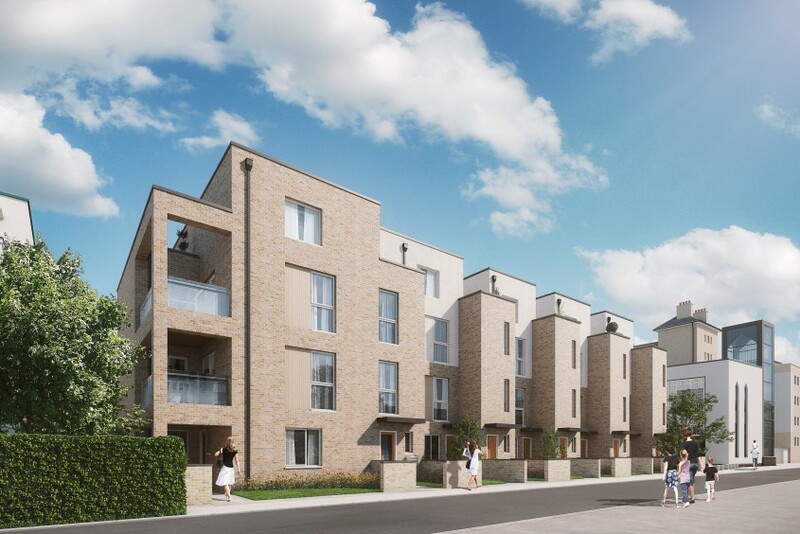 The ceremony on 21st of June saw the developer win two awards as well as a ‘highly commended’ accolade for its project Woodberry Down, one of the capital’s largest estate regeneration schemes in Finsbury Park, comprising 5,500 mixed-tenure homes, community facilities, shops and a nature reserve. The 25-year-long project is being created by Berkeley in partnership with Hackney Council, Genesis Housing, Woodberry Down Community Organisation and the Greater London Authority. 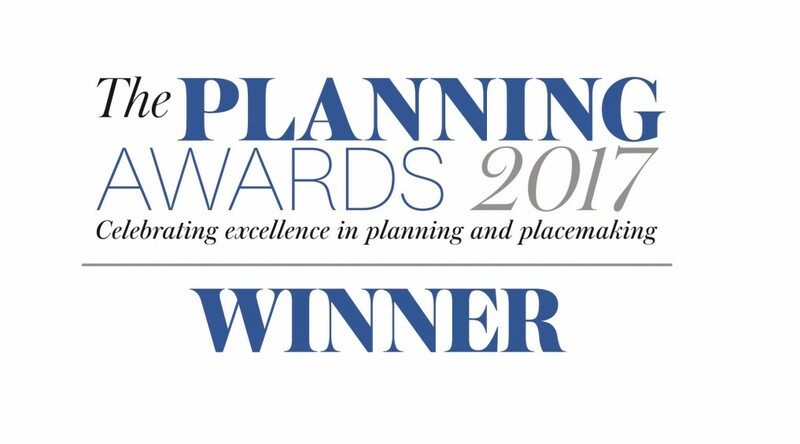 Judged by a panel of industry experts, The Planning Awards is a yearly event to celebrate professional planning work as well as recognise innovation in related activities such as placemaking, housing design and economic development. The What House? Awards are always the highlight of PHM’s calendar, but this year has been especially exciting. We’re thrilled to announce that 12 of the 23 entries we submitted on behalf of our clients were named winners at this year’s ceremony. What’s more, six entries scooped the prestigious Gold prize in their categories, including Berkeley Homes’ impressive win for Best Large Housebuilder. We spent a busy summer writing and designing the What House? Award entries, and were delighted to celebrate our clients’ success at the Grosvenor House Hotel on 18 November. Achieving national recognition for our clients’ achievements is high on our agenda so if you’re already considering which awards to enter in 2017, the deadline for the London Evening Standard New Homes Awards on 3rd February is just around the corner. To find out how PHM can make your development or project shine, call us on 01483 561119. Our client Lendlease’s development, Trafalgar Place, beat stiff competition last Friday to scoop Development of the Year at the British Homes Awards 2016. The annual awards, backed by the Sunday Times, the AJ, Building Research Establishment and the National Home Improvement Council, champion the best in UK housing design in more than a dozen categories. The glittering awards ceremony was held at the London Marriott on Grosvenor Square and was hosted by Professor Robert Adam, chair of the panel of judges, who announced the winners of this year’s awards. The award entry, which we wrote, designed and printed on behalf of Lendlease, was submitted just over three months ago and was met with adulation from the judges who praised the regeneration for its genuine and positive improvements to the centre of Elephant & Castle. Now officially award winning, Trafalgar Place breaks the mould among regeneration schemes in its creation of such a desirable, leafy, residential quarter in such a bustling district of central London. It comprises stunning homes, vibrant green areas, pedestrian-friendly pathways and treelined avenues, which are transforming the neglected, outdated and predominately concrete Heygate Estate into a thriving residential and retail quarter. Representing the first phase of the huge improvements to the area, Trafalgar Place is part of a £1.5 billion regeneration project on 28 acres of land in the centre of Elephant & Castle. To find out more about Elephant Park, visit www.elephantpark.co.uk. Are you working on a project or development of which you are particularly proud? 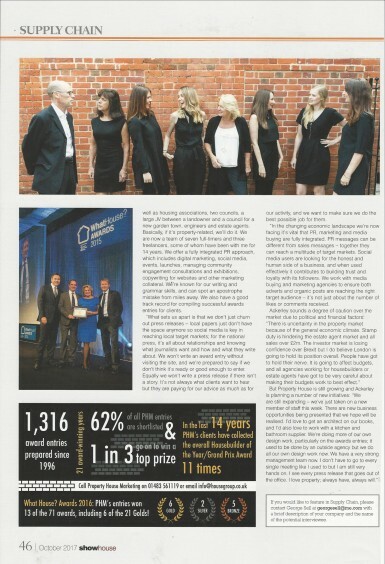 Call the Property House Marketing team today on 01483 561119 to find out how to get the recognition it deserves!